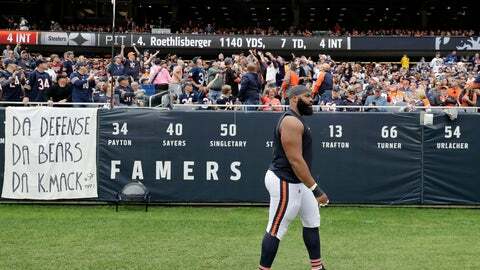 LAKE FOREST, Ill. (AP) — Defensive end Akiem Hicks takes pride in being a leader for the Chicago Bears‘ defense. “This was the first time I’ve been ejected from a game in my entire life, so for me it was very humbling,” Hicks said. “The next time I’m in that situation it will give me a chance to react better. “There’s no feeling like going into the locker room at halftime, or just before halftime, by yourself,” Hicks said. “You sit in the locker room, it’s just not something you’re accustomed to. Hicks hadn’t talked about the incident with media since the ejection occurred. Chicago’s defense ranks second in the NFL this season, and is first against the run. Hicks is a major force in the run defense, and last year also led the team in sacks with 8 ½.